Address: 682030, Khabarovsky kray, Verkhnebureinsky r-n, pos. Chegdomyn, Lesnaya st., 3. 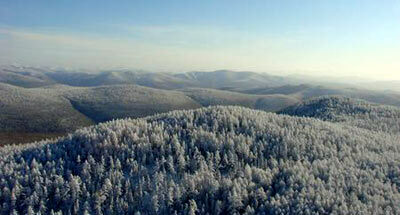 Zapovednik Bureinsky, in the central part of Khabarovsk Krai, was founded in 1987. Its area is 358,4 thousand ha. The Zapovednik is situated within the basins of the rivers Pravaya and Levaya Bureya. The territory is mountainous; the relief is determined by the ranges of the Еzор and Dusse-Alin, within the system of the Khingano-Bureinskoye highlands. The Dusse-Alin range at its watershed point reaches 1500 m above sea level; the highest point is 2325 m. Rivers are of mountainous type, and there are waterfalls and small glacier lakes. As moves higher in the mountains three height belts progressively make way for each other. 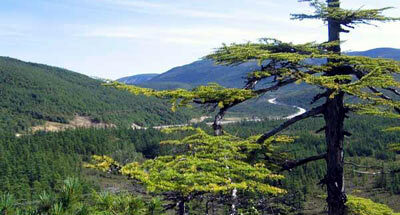 On the mountain slopes forested areas are formed of larch forests and spruce forests; in the river basins there grow Chosenia-poplar forests. Thickets of cedar elfin wood are characteristic, and mountain tundras are widely spread. Natural ecosystems as a whole are distinguished by the good state of preservation of rare communities. Of rare plants on the Zapovednik's territory there grow: Rhodiola rosea, Rhododendron redowskianum, Eaussurea tomentosa, Kochany lily, and Paeonia lactiflora. 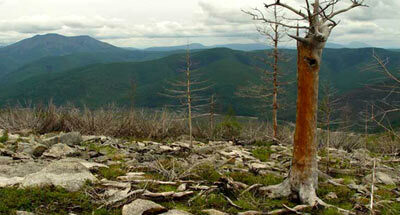 Among animals taiga species prevail (brown bear, skunk bear, musk deer, sable, Tetrao urogalloides, nutcracker, etc. ), with also arctic-alpine species (reindeer, Lagopus mutus, alpine accentor, etc.). Rare species noted in the Red Data Book of Russian Federation are found in the Zapovednik, in particular: fool hen, white-tailed eagle, peregrine falcon, and fish hawk.